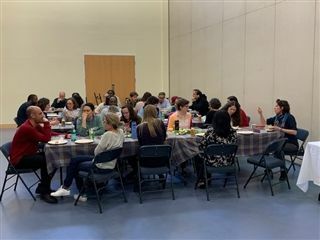 It’s not often that the Friends Community School faculty and staff sit down together for a repast and relaxing conversation. But it happened yesterday afternoon at an appreciation tea organized by the FCS Parent Association. Usually the FCS faculty assembles for a meeting at 2 PM on Wednesdays. 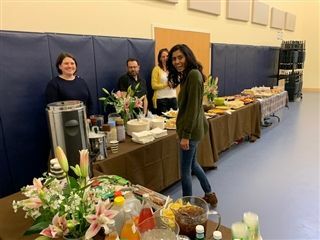 But this week, they instead came to the Gathering Space, where a lovely banquet had been laid out by parent volunteers. Families had delivered an abundance of both sweet and savory treats. Fresh tulips lined the tables—so many bouquets that every teacher could take one home. In the weeks leading up to the Staff Appreciation Tea, parents and students had hand-written notes of appreciation for each faculty member. Affirmations are integral to FCS culture, in keeping with the Quaker value of seeing the Light in each person. At birthdays, Valentine’s Day, Science Night, and other school celebrations, the FCS community shares affirmations. 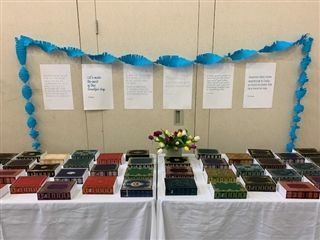 Affirmations were cleverly inserted in homemade boxes made to look like books for each staff member. Also thoughtfully included: a little candy, crackers, and Emergen-C vitamin packets!